Four historically significant baseball bats showcased in the National Baseball Hall of Fame's traveling exhibit "Baseball As America". 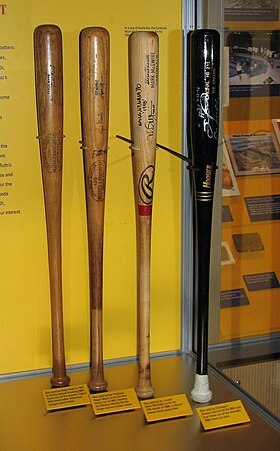 From left to right: bat used by Babe Ruth to hit his 60th home run during the 1927 season, bat used by Roger Maris to hit his 61st home run during the 1961 season, bat used by Mark McGwire to hit his 70th home run during the 1998 season, and the bat used by Sammy Sosa for his 66th home run during the same season. A baseball bat is a smooth wooden or metal club used in the sport of baseball to hit the ball after it is thrown by the pitcher. By regulation it may be no more than 2.75 inches (7.0 cm) in diameter at the thickest part and no more than 42 inches (1.067 m) in length. Although historically bats approaching 3 pounds (1.4 kg) were swung, today bats of 33 ounces (0.94 kg) are common, topping out at 34 ounces (0.96 kg) to 36 ounces (1.0 kg). A baseball bat is divided into several regions. The "barrel" is the thick part of the bat, where it is meant to hit the ball. The part of the barrel best for hitting the ball, according to construction and swinging style, is often called the "sweet spot." The end of the barrel is called the "top," "end," or "cap" of the bat. Opposite the cap, the barrel narrows until it meets the "handle," which is comparatively thin, so that batters can comfortably grip the bat in their hands. Sometimes, especially on metal bats, the handle is wrapped with a rubber or tape "grip". Finally, below the handle is the "knob" of the bat, a wider piece that keeps the bat from slipping from a batter's hands. "Lumber" is an often-used slang term for a bat, especially when wielded by a particularly able batter. The "bat drop" of a bat is its weight, in ounces, minus its length, in inches. For example, a 30-ounce, 33-inch-long bat has a bat drop of minus 3 (30 − 33 = −3). Larger bat drops help to increase swing speed; smaller drops create more power. The bat's form has become more refined over time. In the mid-19th century, baseball batters were known to shape or whittle their own bats by hand, which resulted in a wide range of shapes, sizes, and weights. For example, there were flat bats, round bats, short bats, and fat bats. Earlier bats were known to be much heavier and larger than today's regulated ones. During the 19th century, many shapes were experimented with, as well as handle designs. Today, bats are much more uniform in design. Patent No. 430,388 (June 17, 1890) awarded to Emile Kinst for an "improved ball-bat". The mushroom bat, made in 1906 by Spalding. With baseball bats being larger in the 1900s the Spalding company designed a larger bat with a mushroom-shaped knob on the handle. This enabled the batter to get a better distribution of weight over the entire length of the bat. The Wright & Ditsons Lajoie baseball bat. This bat had a normal size barrel but had two knobs on the handle. The lowest knob was at the bottom of the handle and the other knob was roughly two inches above the lowest knob. This was designed to have better spacing between the hands due to the knob being in the middle of the grip. This also gave batters an advantage when they choked up on the bat, because the second knob provided a better grip. In 1990, Bruce Leinert came up with the idea of putting an axe handle on a baseball bat. He filed a patent application for the 'Axe Bat' in 2007 and the bat started being used in the college and pro ranks over the following years. In 2012, the Marietta College Pioneers baseball team won the NCAA Division III World Series using axe handled bats. Several Major League Baseball players have adopted the bat handle including Mookie Betts, Dustin Pedroia, George Springer, Kurt Suzuki and Dansby Swanson. Baseball bats are made of either wood, or a metal alloy (typically aluminum). Most wooden bats are made from ash; other woods include maple, hickory, and bamboo. Hickory has fallen into disfavor over its greater weight, which slows down bat speed, while maple bats gained popularity following the introduction of the first major league sanctioned model in 1997. The first player to use one was Joe Carter of the Toronto Blue Jays. Barry Bonds used maple bats the seasons he broke baseball's single-season home run record in 2001, and the career home run record in 2007. In 2010, the increased tendency of maple bats to shatter caused Major League Baseball to examine their use, banning some models in minor league play. Different types of wood will fracture differently. For bats made of ash, labels will generally be where the grain spacing is widest. For maple bats they will usually be positioned where grain is tightest. Maple bats in particular were once known (circa 2008) to potentially shatter in a way that resulted in many sharp edges, sometimes creating more dangerous projectiles when it broke. Maple bat manufacture evolved significantly, in cooperation with Major League Baseball, paying special attention to grain slope, and including an ink spot test to confirm safest wood grain orientation. Based on consistent anecdotal reports of sales at sporting goods stores, Maple appears to be displacing Ash as most popular new baseball bat material in the United States. Next and rising in popularity is Bamboo, which has more isotropic fine grain, great strength, and less weight for a bat of any given size. Within league standards there is ample latitude for individual variation, many batters settling on their own bat profile, or one used by a successful batter. Formerly, bats were hand-turned from a template with precise calibration points; today they are machine-turned to a fixed metal template. Historically significant templates may be kept in a bat manufacturers' vault; for example, Babe Ruth's template, which became popular among major-league players, is R43 in the Louisville Slugger archives. Ruth favored a thinner handle than was the norm in the 1920s, and his success caused most to follow. The emerald ash borer, an exotic beetle imported accidentally from Asia, has killed more than 50 million trees and now threatens groves in New York's Adirondack Mountains that are used to make baseball bats. Global temperature rise likely allows the beetle to survive in what was once too cold of a climate. The bat shall be a smooth, round stick not more than 2.61 inches in diameter at the thickest part and not more than 42 inches in length. The bat shall be one piece of solid wood. Bats are not allowed to be hollowed or corked—that is, filled with an alien substance such as cork which reduces the weight. This corking is thought to increase bat speed without greatly reducing hitting power, though this idea was challenged as unlikely on the Discovery Channel series MythBusters. Both wooden and metal alloy (generally aluminum) bats are generally permitted in amateur baseball. Metal alloy bats are generally regarded as being capable of hitting a ball faster and farther with the same power. However, increasing numbers of "wooden bat leagues" have emerged in recent years, reflecting a trend back to wood over safety concerns and, in the case of collegiate summer baseball wood-bat leagues, to better prepare players for the professional leagues that require wood bats. Metal alloy bats can send a ball towards an unprotected pitcher's head up to 60 ft 6 in (18.44 m) away at a velocity far too high for the pitcher to get out of the way in time. Some amateur baseball organizations enforce bat manufacturing and testing standards which attempt to limit maximum ball speed for wood and non-wood bats. The bat is not permitted to be more than 2 5⁄8 inches (67 mm) in diameter. Its "drop" (inches of length minus ounces of weight) must be no more than 3: for example, a 34‑inch (863.6‑mm) bat must weigh at least 31 ounces (880 g). The bat may consist of any safe solid uniform material; the National Federation of State High School Associations rules state only "wood or non-wood" material. To be legally used in a game, an aluminum bat has to be a BBCOR (Batted Ball Coefficient of Restitution) bat because it has been determined that a pitcher loses the ability to protect himself when this ratio is exceeded. In some 12-year-old-and-under youth leagues (such as Little League baseball), the bat may not be more than 2 1⁄4 inches (57 mm) in diameter. However, in many other leagues (like PONY League Baseball, and Cal Ripken League Baseball), the bat may not be more than 2 3⁄4 inches (70 mm) in diameter. Baseball bats are often used as a club-like weapon. ^ a b Jenn Zambri. "Size Matters: Top 10 "Biggest" In MLB History". Bleacher Report. Retrieved 13 September 2015. ^ Beckham, Jeff (August 18, 2014). "Baseball bat with an axe handle brings more power, fewer injuries". Wired.com. Retrieved July 31, 2018. ^ McAuley, Grant (May 19, 2018). "Axe handle bat new weapon of choice for Braves' Swanson". The Game 92.9. Retrieved July 31, 2018. ^ Passan, Jeff (June 23, 2015). "Why the Axe Bat, Dustin Pedroia may help make the round handle obsolete". Yahoo Sports. Retrieved July 31, 2018. ^ a b Patterson, Brittany. "Baseball Bats Threatened by Invasive Beetle". Scientific American. Scientific American. Retrieved 21 November 2017. ^ "'The Well Is Effectively Dead'". NPR.org. 20 September 2010. Retrieved 13 September 2015. ^ a b c d "Wood science and how it relates to wooden baseball bats". woodbat.org. Retrieved 13 September 2015. ^ "Wood bats - on which "side" should the ball's impact be?". baseball-fever.com. Retrieved 14 July 2017. ^ a b c "Safety tests for maple bats mandated". Major League Baseball. Retrieved 14 July 2017. ^ "Hitting with Wood". woodbat.blogspot.com. Retrieved 14 July 2017. ^ "Maple, Ash Baseball Bats May Strike Out". NPR.org. 4 July 2008. Retrieved 13 September 2015. ^ "Babe Ruth changed design of bats to thinner handle". Spokesman-Review. (Spokane, Washington). Associated Press. March 11, 1979. p. C5. ^ Mann, Brian. "A Beetle May Soon Strike Out Baseball's Famous Ash Bats". NPR. NPR. Retrieved 21 November 2017. ^ "Official Baseball Rules" (PDF). Major League Baseball. Retrieved 2012-05-07. ^ "National Collegiate Athletic Association Standard for Testing Baseball Bat Performance" (PDF). acs.psu.edu. October 30, 2006. Retrieved July 14, 2017. ^ "2017 Rules and Regulations for PONY Baseball" (PDF). bsbproduction.s3.amazonaws.com. Retrieved July 14, 2017. ^ Heiss Grodin, Dana (March 7, 2001). "Equipment and product guide". USA Today. Archived from the original on November 8, 2012. ^ Lee, Sandra L. (December 27, 2001). "For now, the mansion stands". Lewiston Morning Tribune. p. 1A. Retrieved November 7, 2012. ^ "Fungo bats". baseballrampage.com. Retrieved July 14, 2017. Wikimedia Commons has media related to baseball bats. "Maple, Ash Baseball Bats May Strike Out". Talk of the Nation. National Public Radio, July 4, 2008.